By 1962 all Australian States and Territories with the exception of the Australian Capital Territory (ACT) had selected a floral emblem (Click here to view all State Floral Emblems). 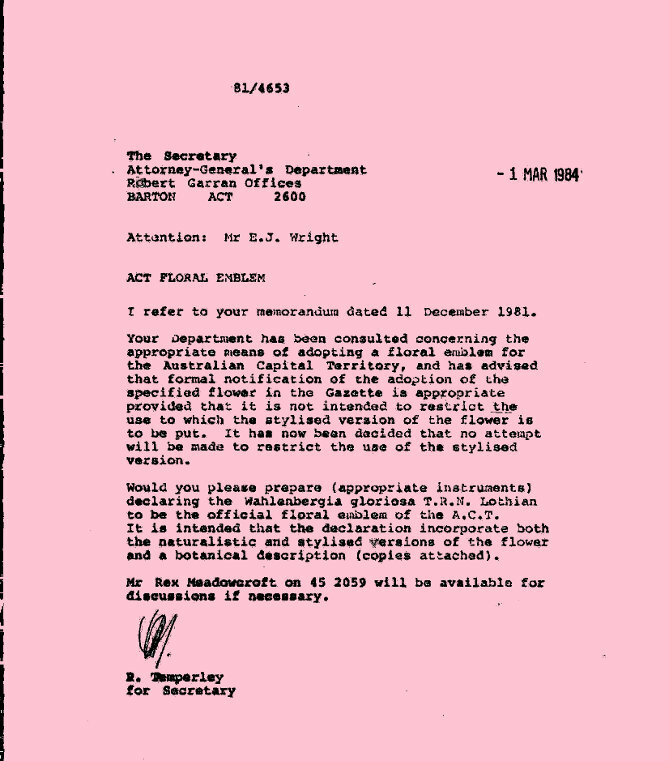 It wasn’t until late 1981 that the Minister for the Capital Territory, Michael Hodgman, called for the establishment of a committee to recommend a suitable floral emblem for the ACT. The file ‘81/4653 Legislation Branch - Floral Emblem for the ACT’ covers the selection and announcement of the floral emblem for the ACT. Folios in this file also raise the issue of copyright and potential misuse of the emblem once it became officially gazetted. The Royal Bluebell (Wahlenbergia gloriosa) was selected as the floral emblem for the ACT. This was announced by the Minister for the Capital Territory, Michael Hodgman on the 26th of May 1982, a copy of his press statement follows. After the announcement it was proposed that the Royal Bluebell be formally adopted by gazettal and a proclamation by the Governor General. This also raised legal issues related to inaccurate representations and inappropriate usage of the emblem and the possiblity of charging fees for its usage. The ACT Government employs the image of the Royal Bluebell on a wide variety of items including the in the ACT Legislative Assembly logo, the ACT Legislative Assembly Mace, the carpet in the ACT Legislative Assembly Chambers, corporate ties and scarf and the postcards reproduced at the top of this page and below. There is also a Bluebell Street in O'Connor named after the flower in 2001. Detail of carpet in ACT Legislative Assembly Chamber. Stationery used in the ACT Legislative Assembly Committee Room. The ACT also has two other floral emblems. NOTE: All Australian wildflowers are protected making it illegal to pick or collect Royal Bluebells in the wild.